Michigan allows students to earn dual credit in academic and/or CTE dual-enrollment courses through Postsecondary Enrollment Options Act and the Career and Technical Preparation Act offered at their high school, postsecondary institution, or online. Public postsecondary institutions are not required to accept these credits (Education Commission of the States, 2015). Gateway to College National Network, Henry Ford College, and Mott Community College have partnered with local education agencies to provide Early College High Schools as part of the Early College High School Initiative (ECHSI). An additional group of high school entities (high schools as well as regional consortia of schools) have partnered with institutions of higher education in Michigan to provide 68 Early/Middle College High School programs (Michigan Department of Education, n.d.). More information about schools participating in ECHSI is available at the ECHSI website (Jobs for the Future, n.d.). Find more information about Michigan’s Early/Middle College High Schools at the Michigan Department of Education website. 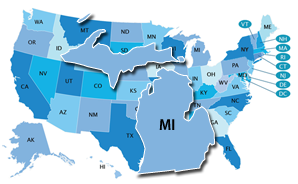 In 2009, Michigan mandated that all students in Grades 7–12 have an Educational Development Plan (EDP; U.S. Department of Labor, 2013). EDPs are “living” documents, updated as student interests and abilities become more obvious and focused. Students are required to develop an EDP with guidance from school advisors. When applicable, parents and community contacts also should be included (Michigan Department of Education, 2009). In addition to requirements listed above, all students must complete one or more credit or non-credit courses or learning experiences offered through an online format. Michigan provides some Early Warning System guidance as part of its Multi-Tiered Systems of Support. This includes training materials, such as slides and a primer on dropout prevention. The level at which Early Warning System data are reported and who can access the data is not publicly available.